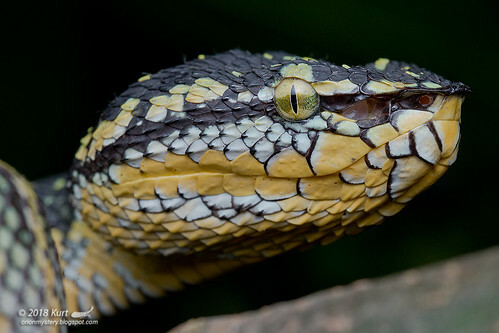 #2 Head shot of the same Malayan Spinejaw Snake (Xenophidion schaeferi). #3 A beautiful Western Bush Viper (Atheris chlorechis) we spotted late one night on our last day in Ghana back in August 2018. 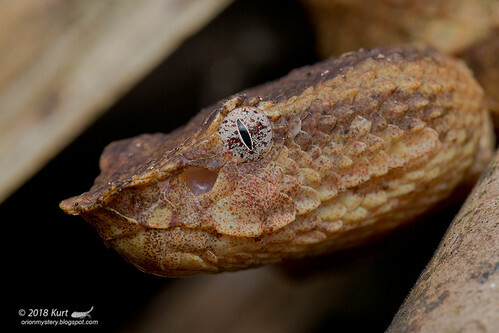 #4 Female Bornean Keeled Pitviper (Tropidolaemus subannulatus) from Sarawak, Borneo. 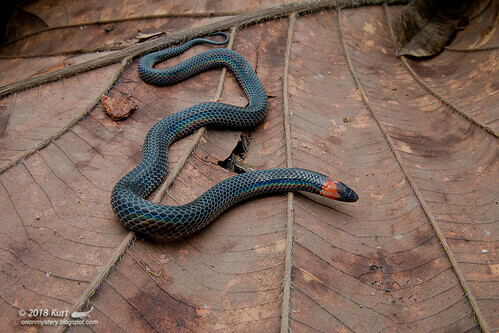 #5 Blue Coral Snake (Calliophis bivirgatus tetrataenia). Lowland forest of Sarawak, Borneo. 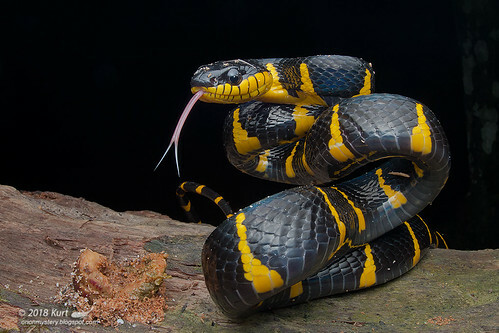 #6 Up close with a Gold-ringed Cat Snake / Mangrove Cat Snake (Boiga dendrophila) from the lowland forest of Selangor, Peninsular Malaysia. 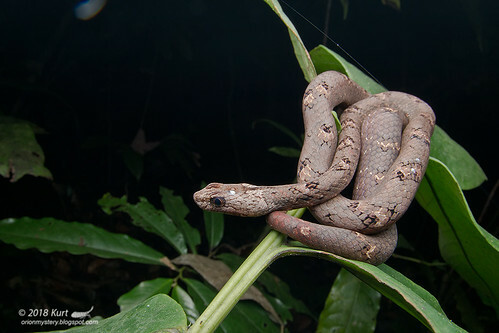 #7 White-spotted Cat Snake (Boiga drapiezii) from the lowland forest of Selangor, Peninsular Malaysia. 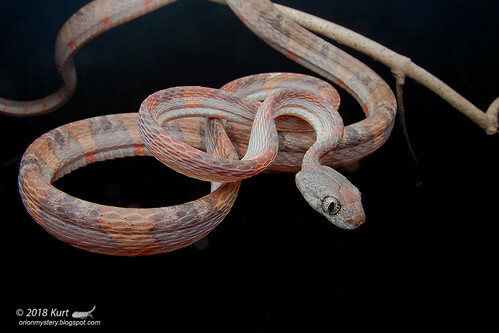 #8 Beautiful salmon pink Pale-spotted Cat Snake (Boiga drapiezii) from the lowland forest of Sarawak, Malaysian Borneo. 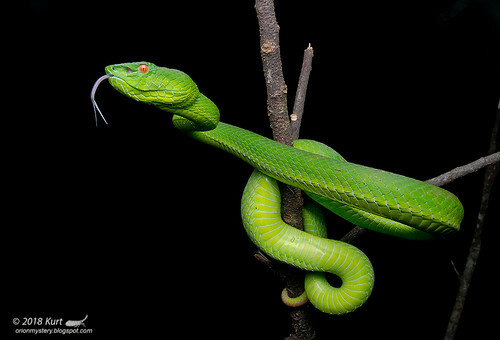 #9 Adult female Wagler's Pit Viper (Tropidolaemus wagleri) from Sumatra, Indonesia. 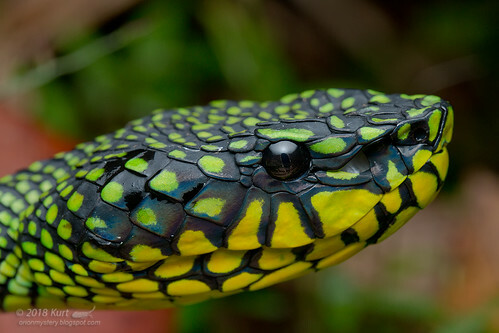 #10 Up close with a stunning Gold-ringed Cat Snake (Boiga dendrophila annectens) from the lowland forest of Sabah, Malaysian Borneo. 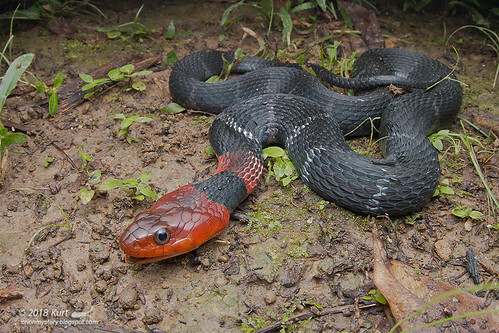 #11 Red-headed Krait (Bungarus flaviceps baluensis) from Sabah, Malaysian Borneo. 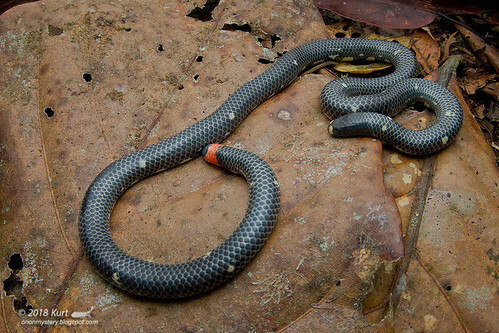 #12 Speckle-bellied Keelback (Rhabdophis chrysargos) from the lowland forest of Sabah, Malaysian Borneo. 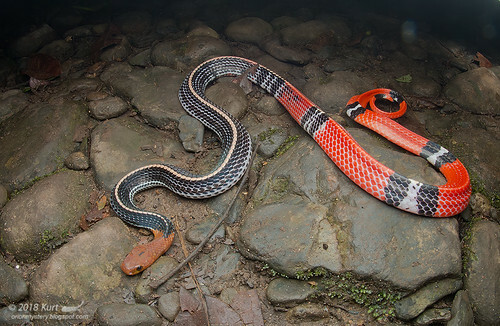 #13 Beautiful little Striped Coral Snake (Calliophis intestinalis) from the lowland forest of Sarawak. 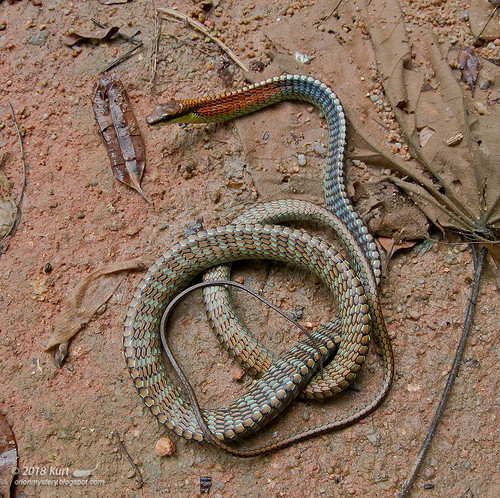 #14 Up close with a Red-tailed Racer / Grey-tailed Racer (Gonyosoma oxycephalum) from the lowland forest of Peninsular Malaysia. 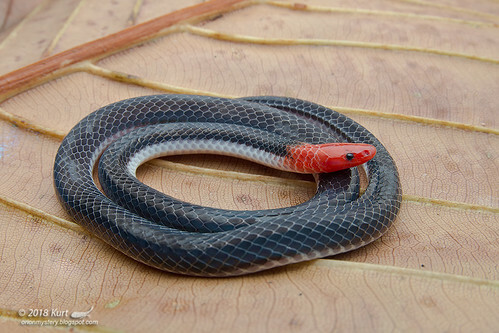 #15 The same Red-tailed Racer / Grey-tailed Racer (Gonyosoma oxycephalum) from the lowland forest of Peninsular Malaysia. #16 Up close with a beautiful melanistic Dog-toothed Cat Snake (Boiga cynodon) from the lowland forest of Sarawak, Malaysian Borneo. 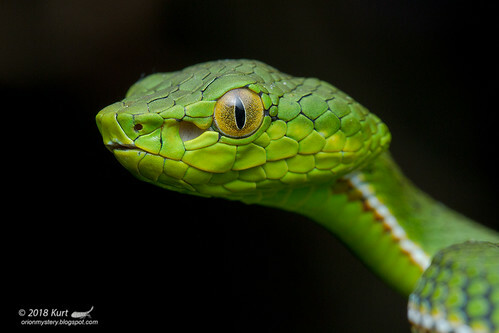 #17 Bornean Leaf-nosed Pit Viper (Trimeresurus borneensis) from the lowland forest of Sabah, Malaysian Borneo. 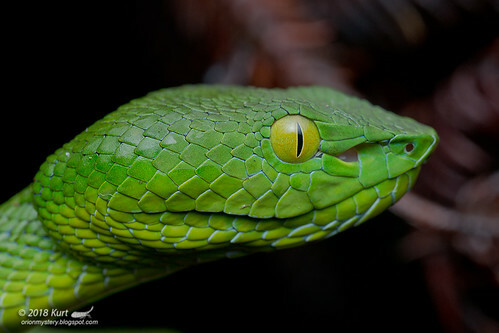 #18 Up close with a Borneo Pit Viper (Trimeresurus borneensis) from the lowland forest of Sabah, Malaysian Borneo. 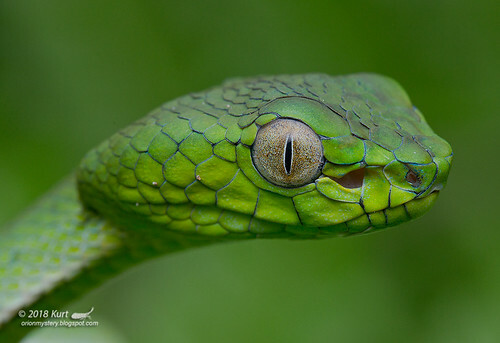 #19 Cute little juvenile Malcolm's Pit Viper (Trimeresurus malcolmi) spotted by Bjorn Lardner. Montane forest of Sabah, Malaysian Borneo. 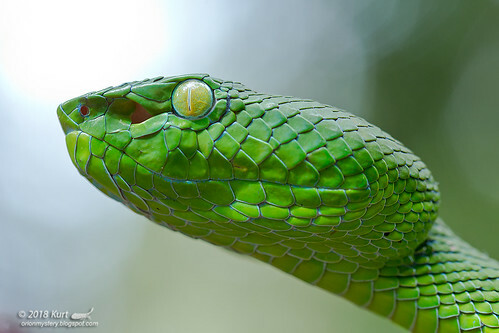 #20 Up close with a stunningly beautiful Malcolm's Pitviper (Trimeresurus malcolmi) from the montane forest of Sabah, Malaysian Borneo. 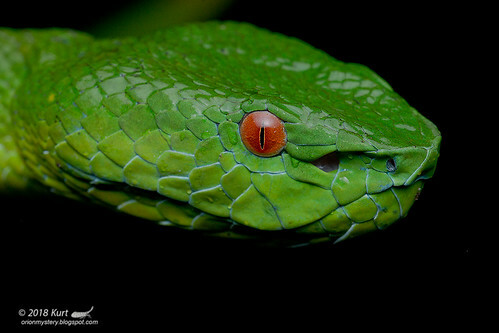 #21 Up close with a stunningly beautiful Malcolm's Pitviper (Trimeresurus malcolmi) from the montane forest of Sabah, Malaysian Borneo. 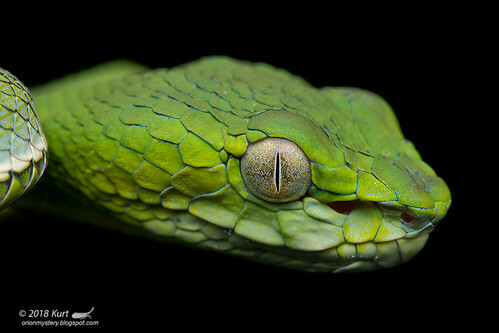 #22 Up close with a juvenile Sumatran Pit Viper (Trimeresurus sumatranus) from the lowland forest of Sabah, Malaysian Borneo. 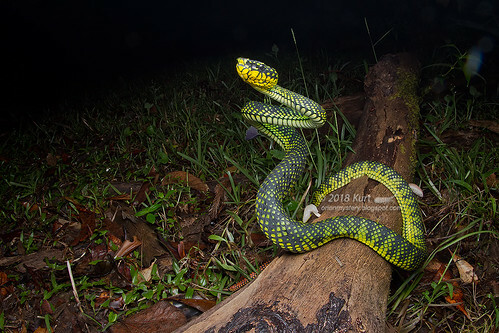 #23 Juvenile Sumatran Pit Viper (Trimeresurus sumatranus) we found back in June 2018, lowland forest of Sabah, Malaysian Borneo. 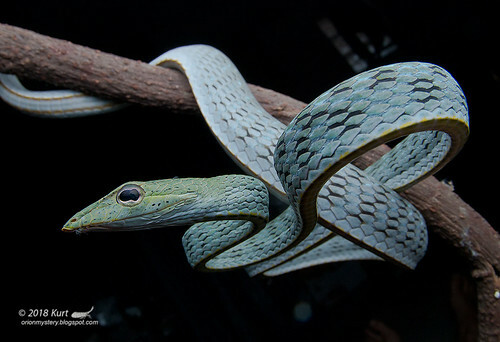 #24 Sumatran Pitviper (Trimeresurus sumatranus / Parias sumatranus) from the lowland forest of Sabah, Malaysian Borneo. 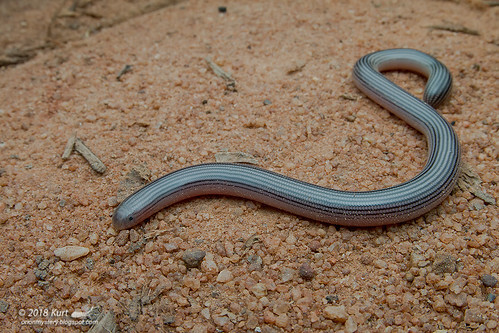 #25 Spotted Blind Snake (Afrotyphlops punctatus?) 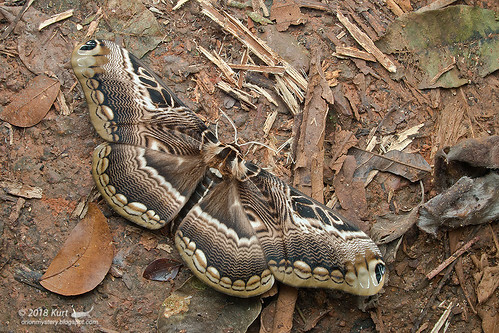 from lowland forest near Kubease, Ghana. August 2018. 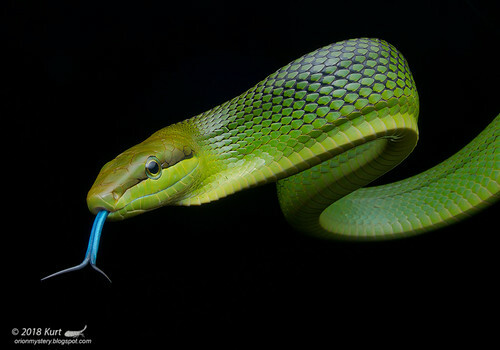 #26 Ball Python (Python regius) from Ghana. 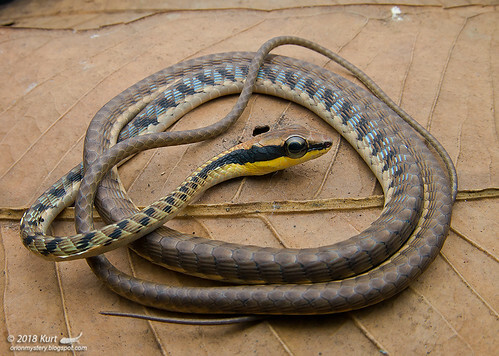 #27 Beautiful little Speckle-headed Whip Snake (Ahaetulla fasciolata) from the lowland forest of Sarawak, Malaysian Borneo. 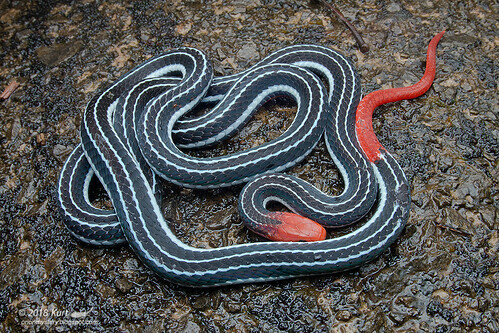 #28 Chequer-bellied Keelback / Sarawak Keelback (Amphiesma sarawacense / Hebius sarawacense) from the montane forest of Sabah, Malaysian Borneo. 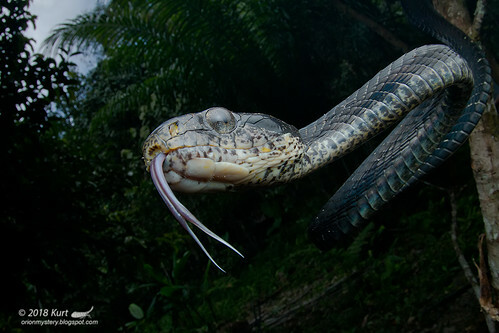 #29 Up close with a dark form ( melanistic) Dog-tooted Cat Snake (Boiga cynodon) from the lowland forest of Sabah, Malaysian Borneo. 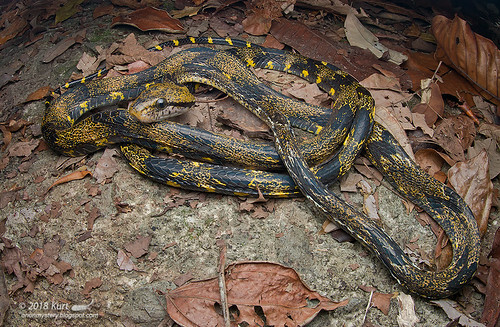 #30 Orangeneck Keelback / Yellow-headed Keelback (Macropisthodon flaviceps) from near Medan, Sumatra. 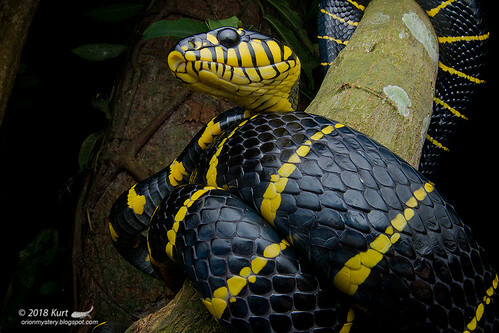 Big, docile beauty. Didn't try to bite nor escape. 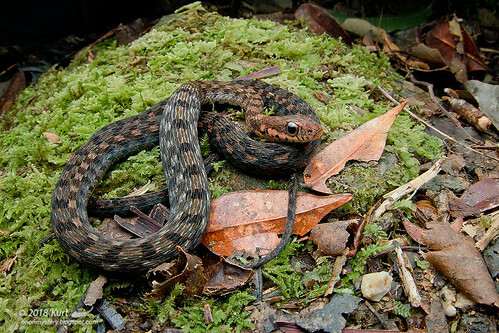 #31 A lovely Specklebelly Keelback (Rhabdophis chrysargos) that crossed our path one morning at the highland of Pahang. 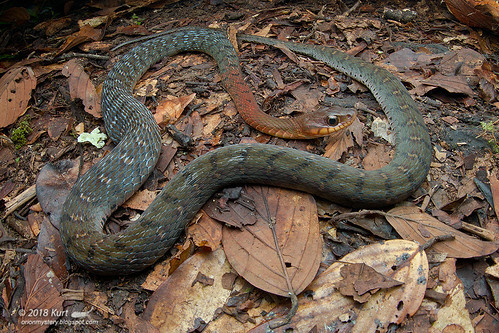 #32 Kopstein's Bronzeback (Dendrelaphis kopsteini) from the lowland forest of Peninsular Malaysia. 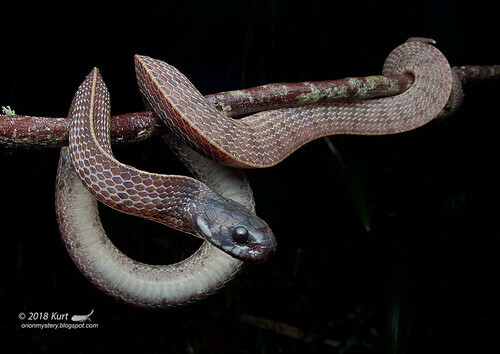 #34 Lovely Pink-headed Reed Snake (Calamaria schlegeli) from the lowland forest of Sarawak, Borneo. 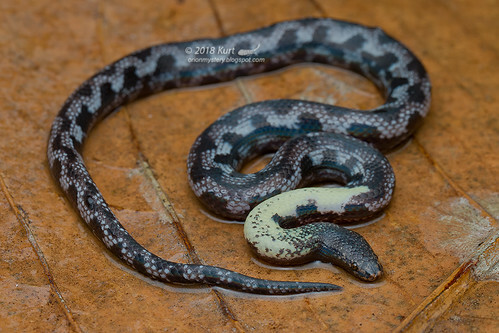 #35 Cute little Keeled Snail-eating Snake (Pareas carinatus) from Sumatra, Indonesia. 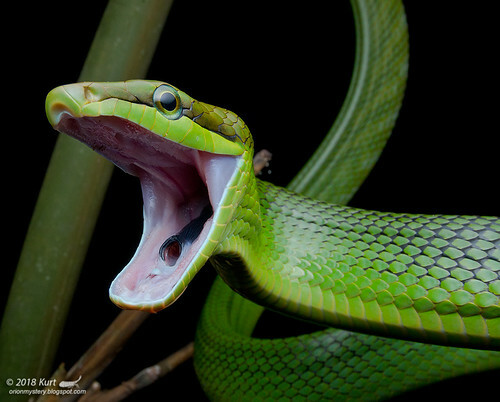 #36 Spotted Snail-eating Snake (Pareas margaritophorus), Sumatra, Indonesia. 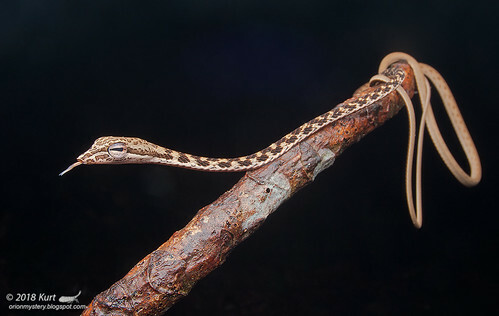 #37 Neonate Keel-bellied Whip Snake / Brown Whip Snake (Dryophiops rubescens) from the lowland forest of Sumatra, Indonesia. 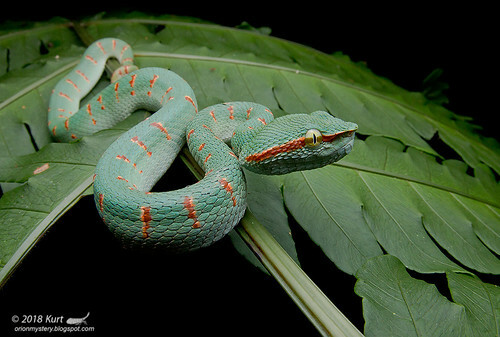 #38 Sabah Pit Viper (Trimeresurus sabahi sabahi) from the montane forest of Sabah, Malaysian Borneo. 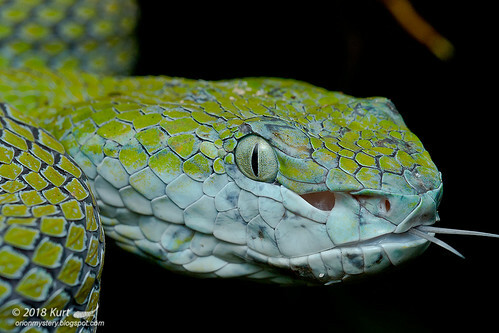 #39 Up close with a Sabah Pitviper (Trimeresurus sabahi) from the montane forest of Sabah, Malaysian Borneo. 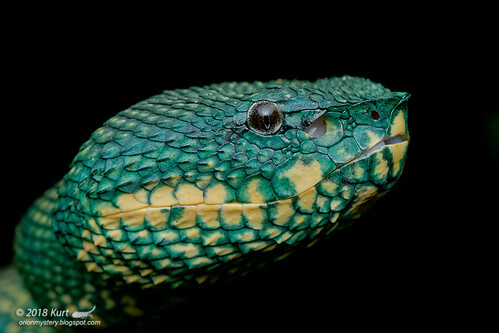 #40 Up close with a beautiful female Siamese Peninsular Pitviper (Trimeresurus fucatus) from the highland of Pahang, Peninsular Malaysia. 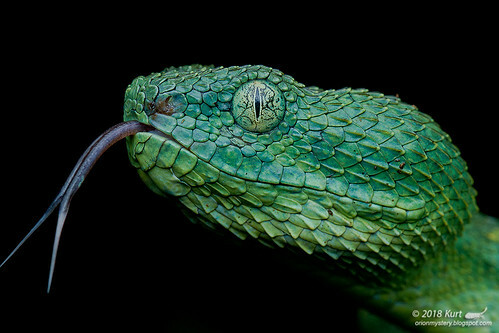 #41 Up close with a Siamese Peninsular PitViper (Trimeresurus fucatus) from the highland of Pahang, Peninsular Malaysia. 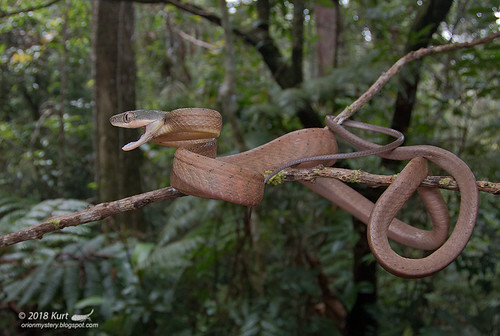 #42 Dark-headed Cat Snake (Boiga nigriceps) from Pahang, Peninsular Malaysia. 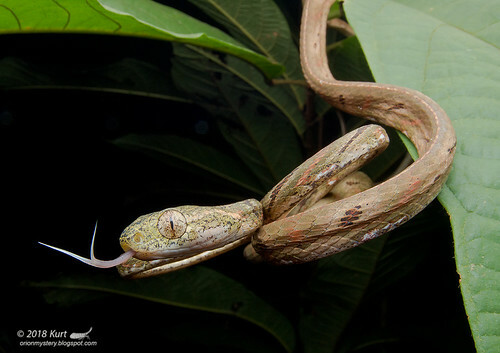 #43 A nice looking Asian Vine Snake (Ahaetulla prasina) with unusual coloration, Peninsular Malaysia. 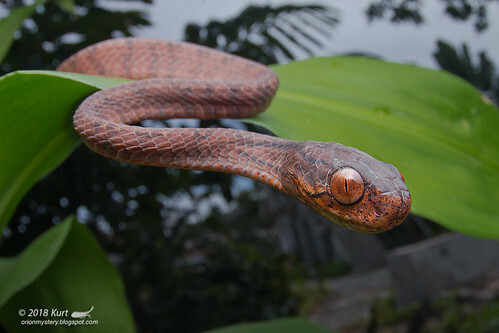 #44 Dorsal view of a Mountain Pipe Snake (Anomochilus monticola). Montane forest of Sabah, Malaysian Borneo. 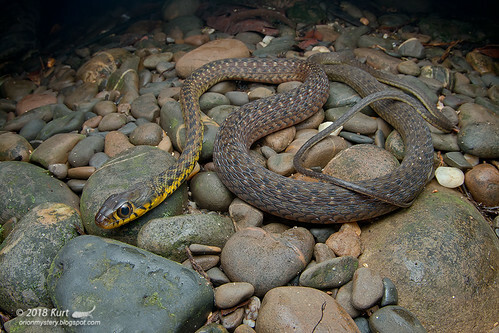 #45 Large-eyed Water Snake / Spotted Keelback (Xenochrophis maculatus) from the lowland forest of Sarawak, Malaysian Borneo. 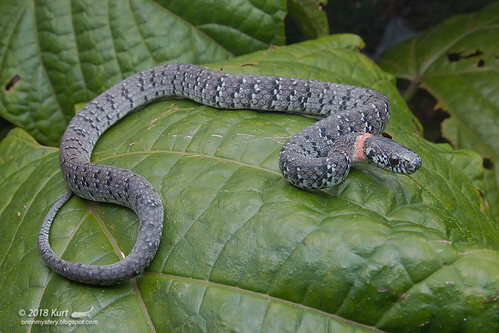 #46 A beautiful little juvenile female Wagler's Pitviper (Tropidolaemus wagleri) we found a couple of nights ago, lowland forest of Peninsula Malaysia. 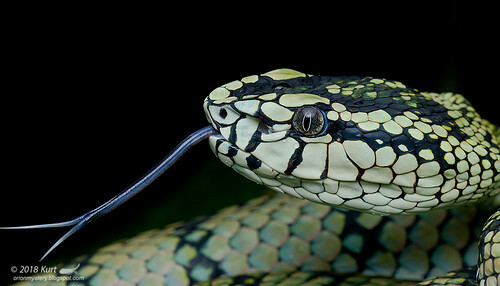 #47 Female Hagen's Pitviper (Trimeresurus hageni) from the lowland forest of Selangor, Peninsula Malaysia. 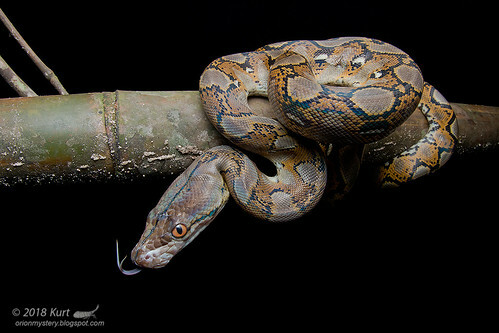 #48 A juvenile Reticulated Python (Python reticulatus) I found one night in the lowland forest of Peninsular Malaysia. Approximately 2 feet long. 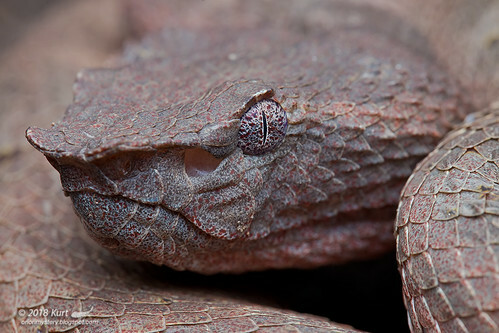 #49 Dusky Mock Viper / Common Mock Viper (Psammodynastes pulverulentus) from Sabah, Malaysian Borneo. 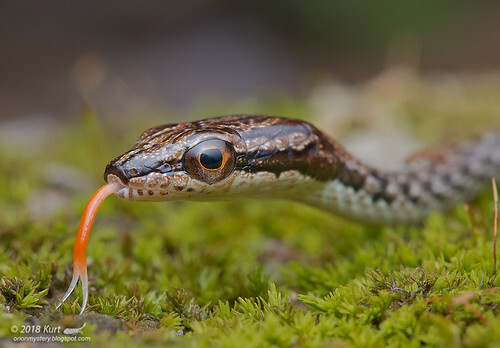 #50 Cute little Ring-necked Litter Snake (Pseudorabdion albonuchalis) from the lowland forest of Sabah, Malaysian Borneo. 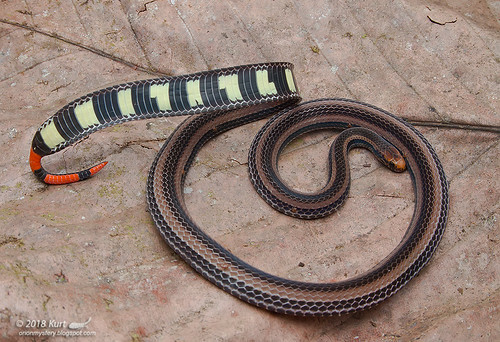 #51 Striped Dwarf Treesnake (Dryocalamus tristrigatus) from the montane forest of Sabah, Malaysian Borneo. 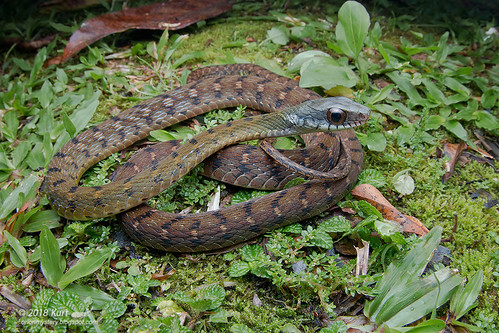 #52 Smooth Snail-eating Snake (Asthenodipsas laeavis) from the highland of Sabah, Malaysian Borneo. 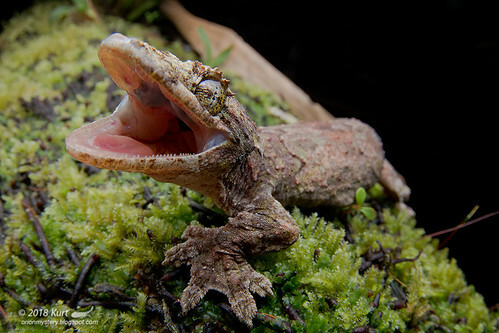 #53 Doria's Anglehead Lizard (Gonocephalus doriae) from the lowland forest of Sarawak, Malaysian Borneo. 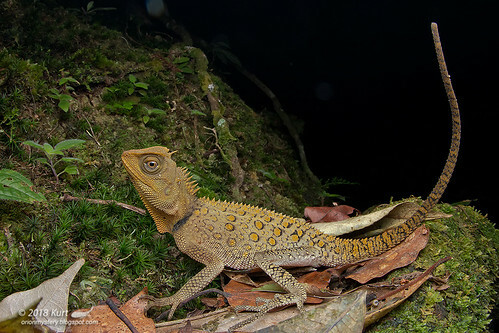 Probably my most favorite lizard in Malaysian Borneo. 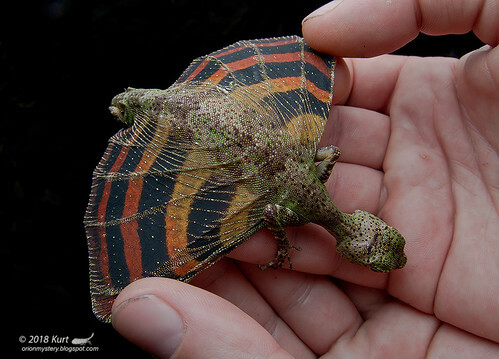 #54 Check out the amazing markings on the patagium of this Five-banded Gliding Lizard (Draco quinquefasciatus). Lowland forest, Sabah, Malaysian Borneo. 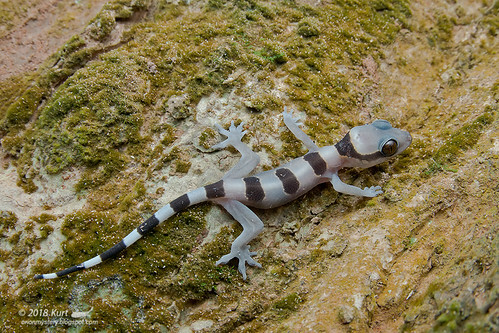 #55 Borneo Bow-fingered Gecko (Cyrtodactylus malayanus) from the lowland forest of Sarawak, Malaysian Borneo. 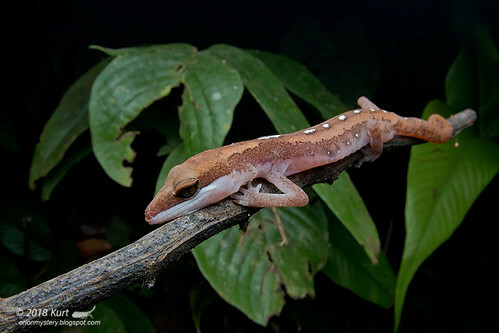 #56 Banded Leaf-toed Gecko (Hemidactylus fasciatus)?, Kubease, Ghana. 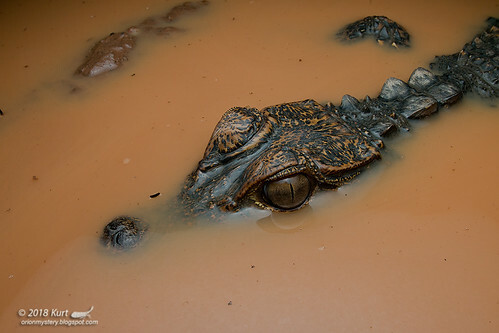 #57 Baby Dwarf Crocodiles (Osteolaemus tetrapis) we found in a marsh pond up on a hill in Ghana, August 2018. They're just so cute! 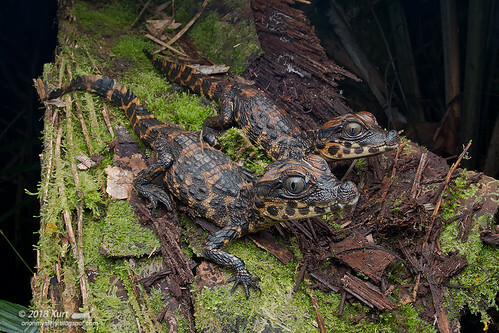 #58 Baby Dwarf Crocodiles (Osteolaemus tetrapis) we found in a marsh pond up on a hill in Ghana, August 2018. They're just socute! 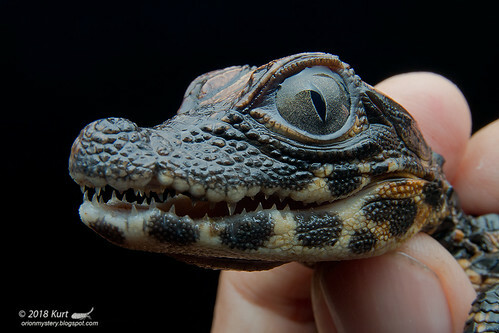 #59 Up close with an adult Dwarf Crocodile (Osteolaemus tetrapis) from Ghana. We found two adults and many cute juveniles in Ghana back in August 2018. 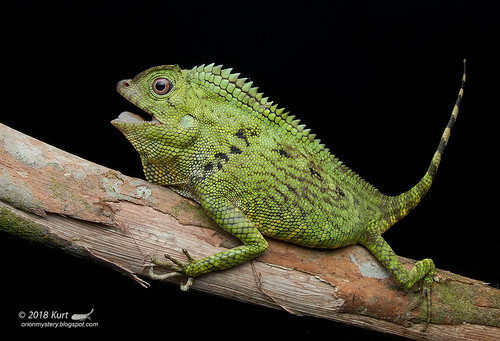 #60 Malayan Mountain Horned Agamid / Titiwangsa Horned Tree Lizard (Acanthosaura titiwangsaensis. Highland of Pahang, Peninsular Malaysia. 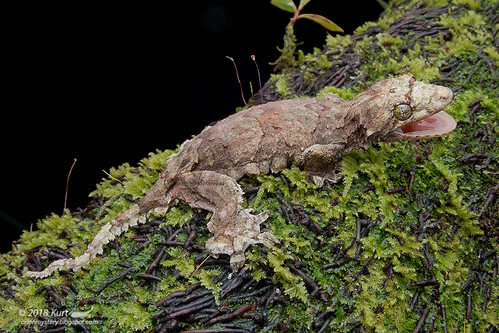 #61 Up close with a Sabah Flying Gecko (Ptychozoon rhacophorus) from the highland of Sabah, Borneo. 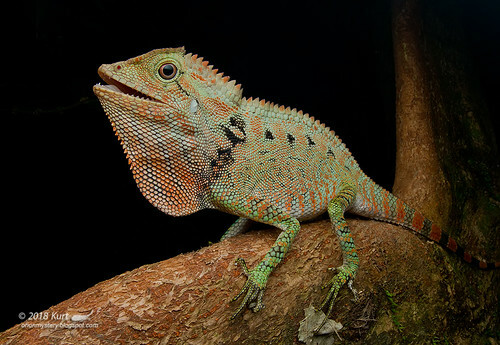 #63 Boulenger's Tree Agama (Dendragama boulengeri) from the highland of Sumatra, Indonesia. 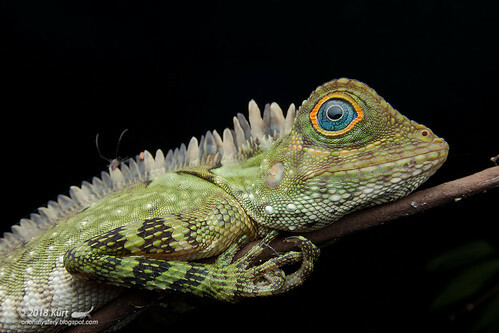 #64 Up close with a Blue-eyed Anglehead Lizard (Gonocephalus liogaster) from the lowland forest of Sarawak, Borneo. 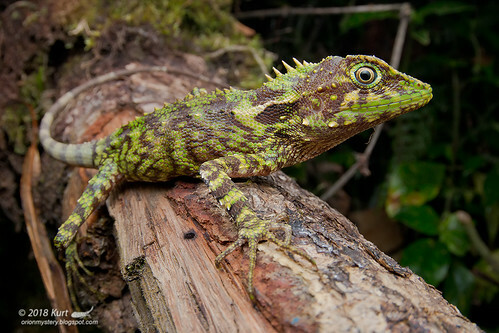 #65 My new favorite lizard in Borneo - Doria's Anglehead Lizard (Gonocephalus doriae) , Sarawak, Borneo. 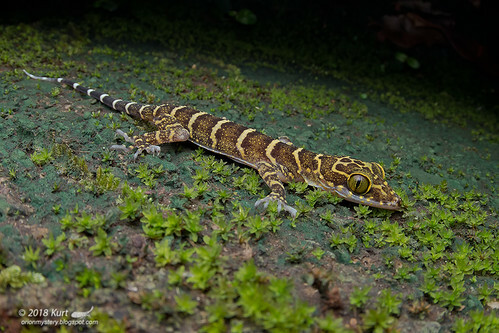 #66 Cat Gecko (Aeluroscalabotes felinus) from the lowland forest of Sarawak, Malaysian Borneo. 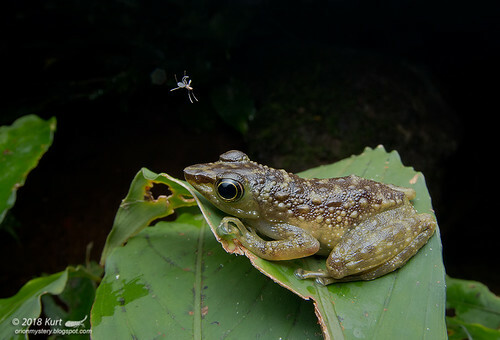 #67 A male Smooth Guardian Frog (Limnonectes palavanensis) with tadpoles on his back. Lowland forest of Sarawak, Borneo. 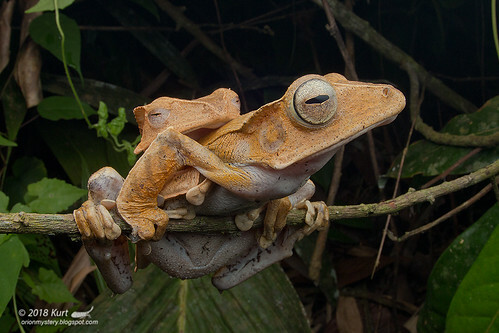 #68 A pair of File-eared Tree Frogs (Polypedates otilophus) in amplexus. Lowland forest of Sabah, Malaysian Borneo. 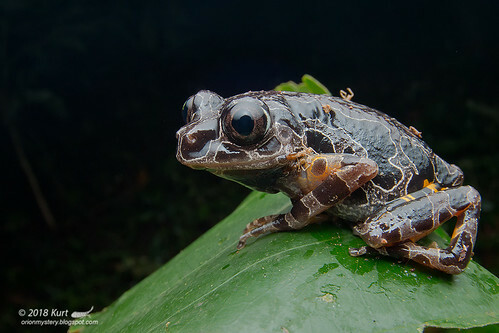 #69 Malaya Bug-eyed Frog (Theloderma leprosum) from the highland of Pahang, Peninsular Malaysia. Probably the most elusive of all the Thelodermids in Malaysia. #70 This should be quite an easy "spot me" challenge. Go ahead! Peninsular Malaysia. 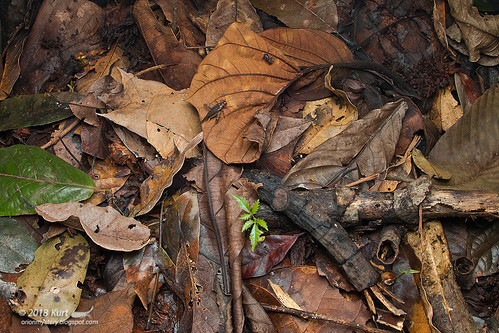 If you can't find it, you can cheat by looking at the other 3 photos. 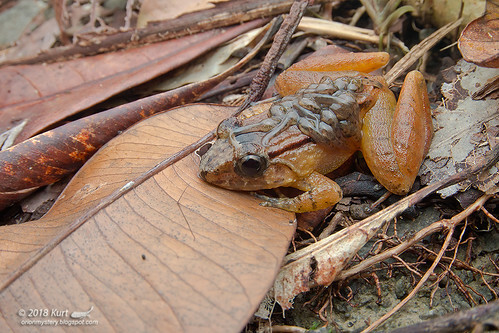 #71 One of the many lovely frogs we came across in the forest of Ghana. Kassina arboricola. August, 2018, Kyebi, Ghana. 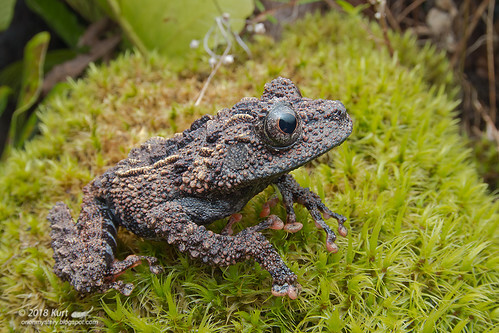 #72 Kobayashi's Horned Frog (Megophrys kobayashii) from the montane forest of Sabah, Malaysian Borneo. 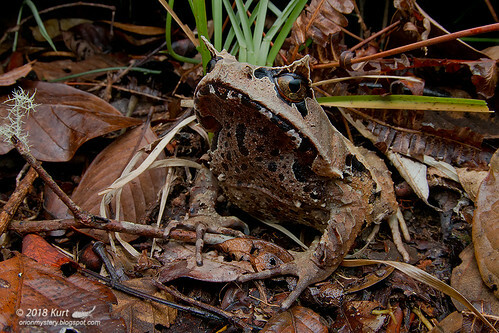 #73 Malayan Horned Frog / Bornean Horned Frog / Malayan Leaf Frog (Megophrys nasuta) in amplexus, lowland forest of Sarawak, Malaysian Borneo. 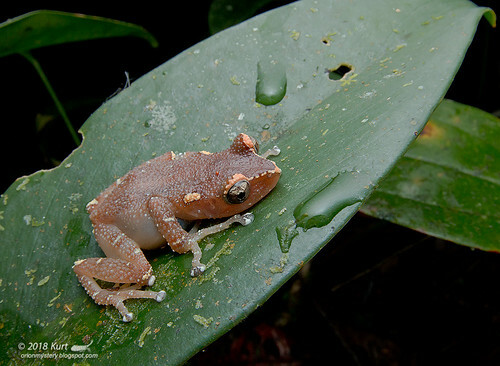 #74 Sticky Frog (Kalophrynus sp.) from the lowland forest of Sarawak, Malaysian Borneo. 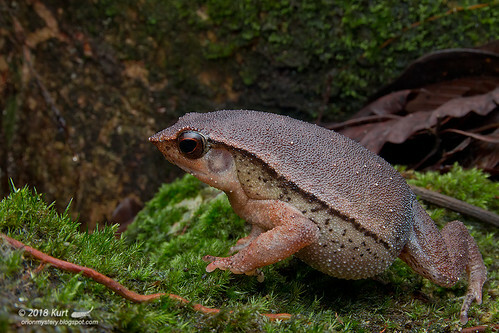 #75 Lesser Bornean Narrow-mouthed Frog (Microhyla borneensis) from the lowland forest of Sarawak, Malaysian Borneo. #76 Black-spotted Rock Skipper (Staurois guttatus) from the lowland forest of Sarawak, Malaysian Borneo. #77 Green-spotted Rock Skipper (Staurois tuberilinguis) and a bonus in-flight insect! Sabah, Malaysian Borneo. #78 Nyctixalus sp. 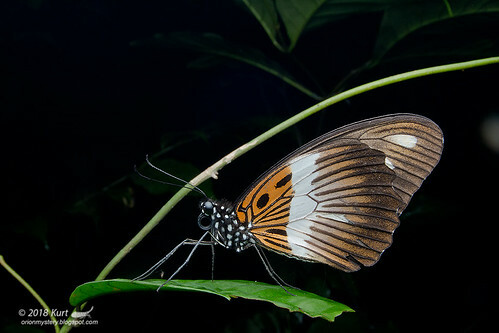 from the montane forest of Sabah, Malaysian Borneo. 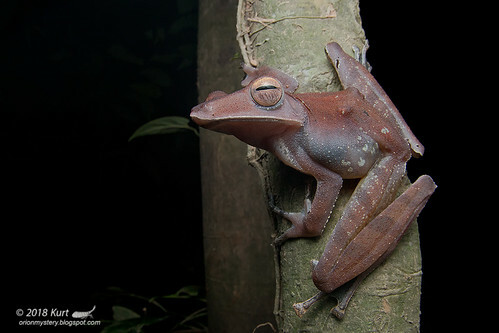 #79 Borneo Flying Frog (Rhacophorus borneensis) from the lowland forest of Sarawak, Borneo. 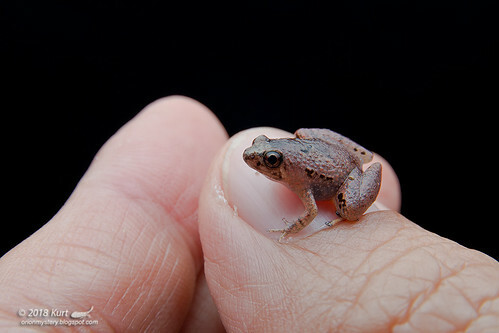 #80 Sticky Frog (Kalophrynus kiewi?) 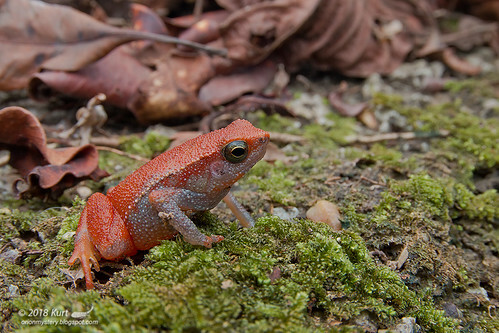 from the lowland forest of Peninsular Malaysia. 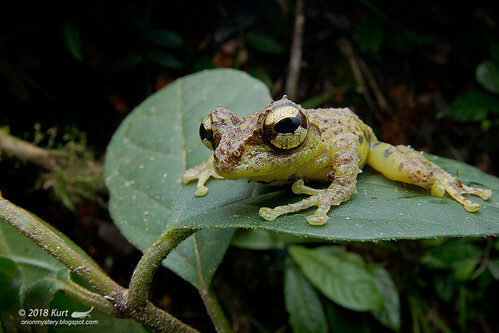 #81 Mossy Bush Frog (Philautus macroscelis) from the montane forest of Sabah, Malaysian Borneo. 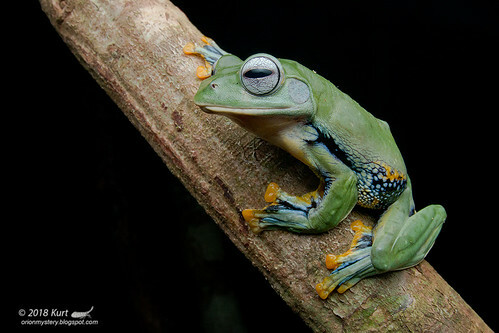 #82 Collett's Tree Frog (Polypedates colletti) from the lowland forest of Sarawak, Malaysian Borneo. #83 Eyes Eyes Baby. 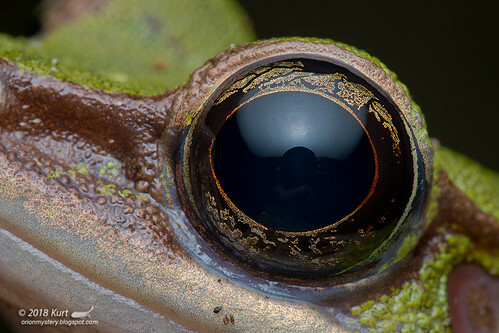 The eye of a Poisonous Rock Frog / Hose's Frog (Odorrana hosii), from Peninsular Malaysia. 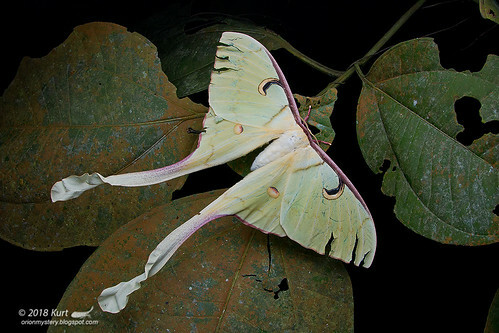 #84 A gorgeous female Malaysian Moon Moth (Actias maenas) i spotted a few nights ago in a lowland forest, Peninsular Malaysia. 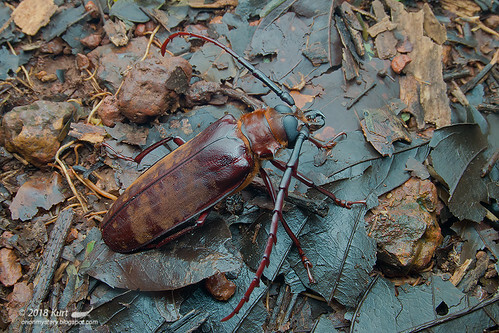 #85 The African Brahmaeidae, Dactylocerus lucina. Ghana, August 2018. #86 Mimetic Swallowtail (Papilio cynorta) - ID suggested by Oskar Brattstrom.. Ghana, August 2018. 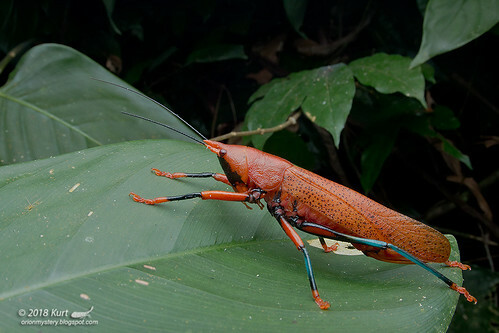 #87 Beautiful katydid (Plastocorypha vandicana?) 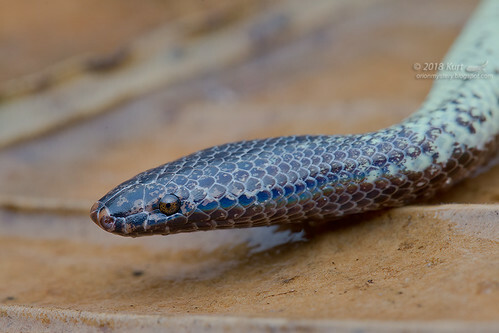 we found while herping in the lowland forest near Kubease, Ghana, August 2018. 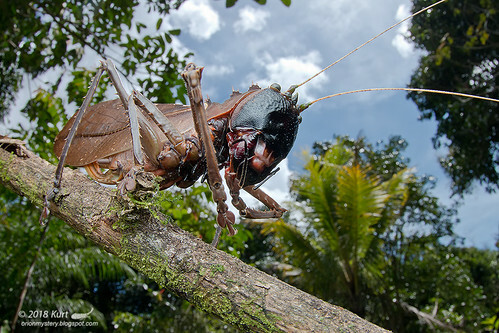 #88 Dragon-head Katydid (Ellatodon blanchardi) from the lowland forest of Sabah, Malaysian Borneo. #90 Barylestis sp. 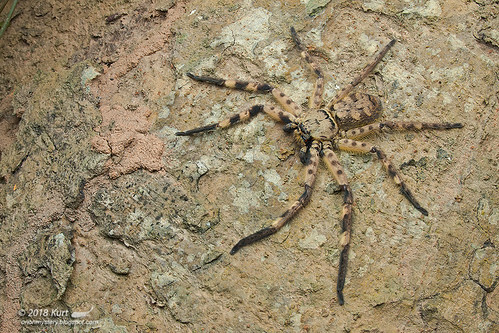 Huntsman Spider, Ghana. 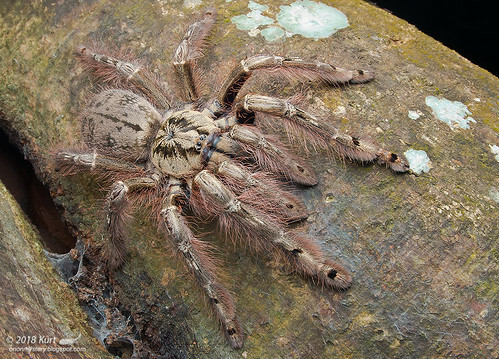 #91 While out looking for herps, we found a few Feather leg baboon Tarantula (Stromatopelma calceatum). This one was a female. Kubease, Ghana. 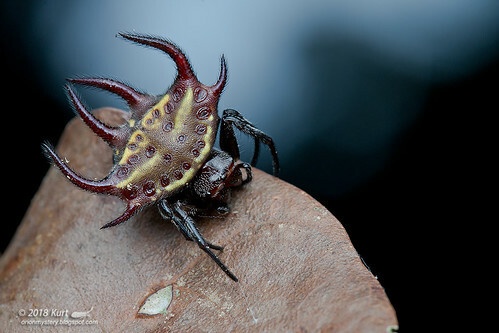 #92 Spiny Orb-weaver, Gasteracantha sp. from Kubease, Ghana. August 2018. 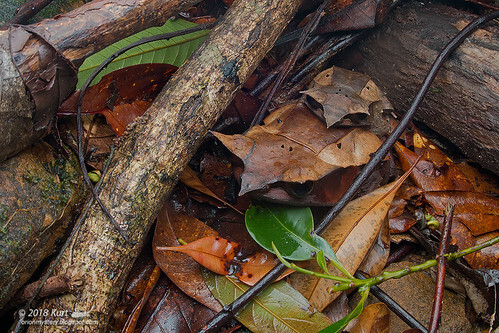 #93 Amazing Dead Leaf Mantis (Deroplatys dessiccata) from the lowland forest of Sabah, Malaysian Borneo. 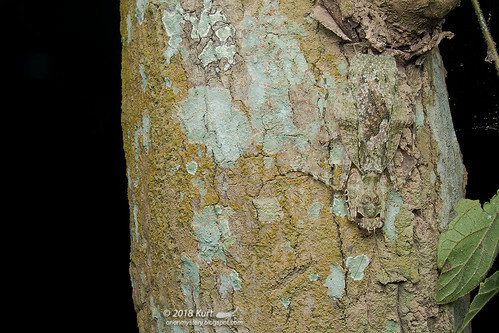 #95 Bark Mantis, likely Theopompella sp., maybe T. aurivilli. Kubease, Ghana, August 2018. 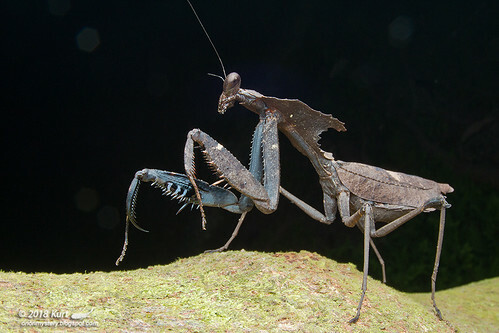 #96 A lovely mantis I found at the lowland forest of Sarawak, Malaysian Borneo. 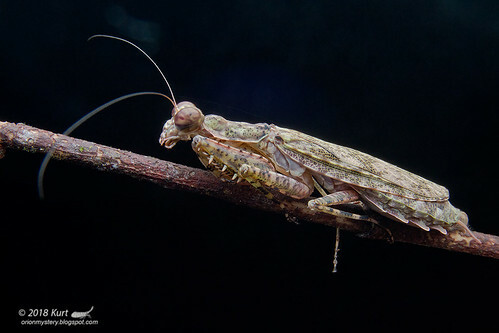 Female Humbertiella ocularis. 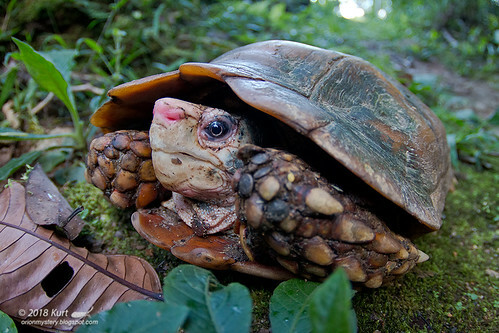 #97 Impressed Tortoise (Manuoria impressa) we found at the highland of Pahang, Peninsular Malaysia. There were many ticks on him/her. 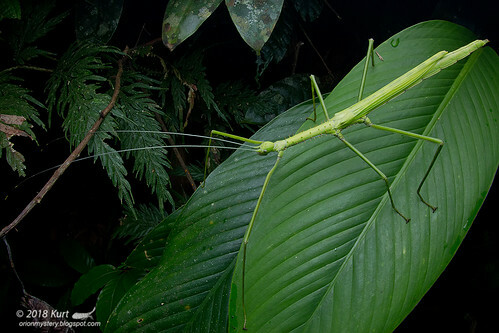 #98 Stick Insect (Diesbachia sophiae) from the lowland forest of Poring, Sabah (Borneo). 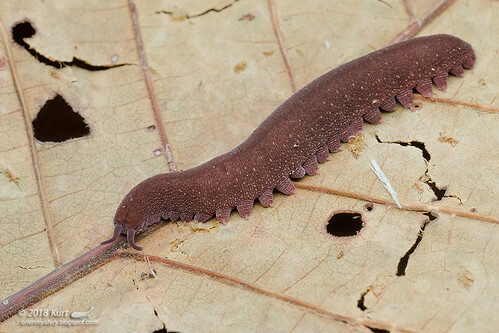 #99 Velvet Worm. 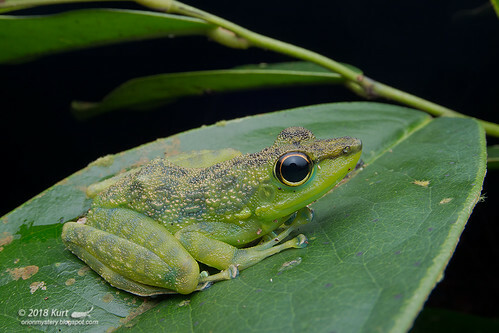 Either Eoperipatus sp. 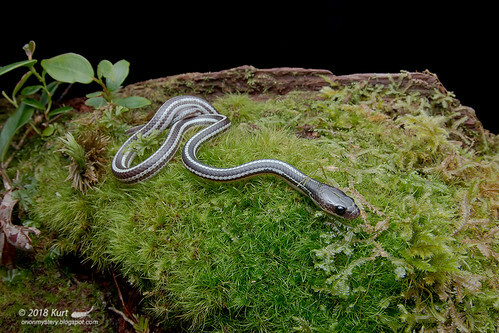 or Typhloperipatus sp., from the lowland forest of Sarawak, Malaysian Borneo. 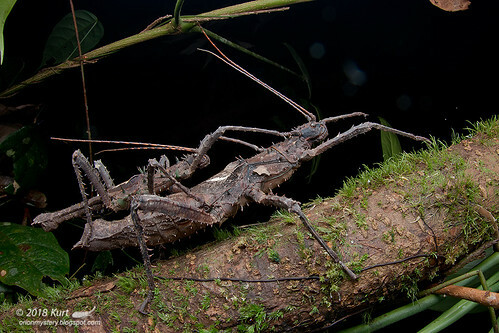 #100 A mating pair of stick insects (Haaniella sp.) 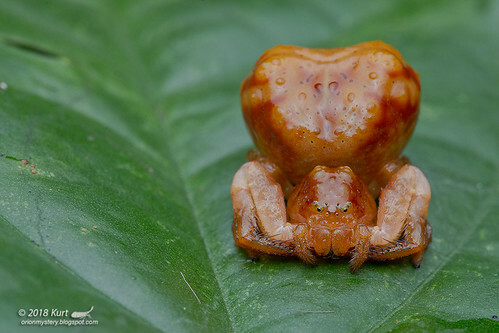 from the lowland forest of Sarawak, Malaysian Borneo.